LET US HELP YOU CREATE A GREAT PERSONAL DESIGN, JUST FOR YOU! Great Ideas can come from anywhere! If you or your customer have an idea for a custom product, you can take advantage of our design and support capabilities to help your idea become a reality… a woven treasure. 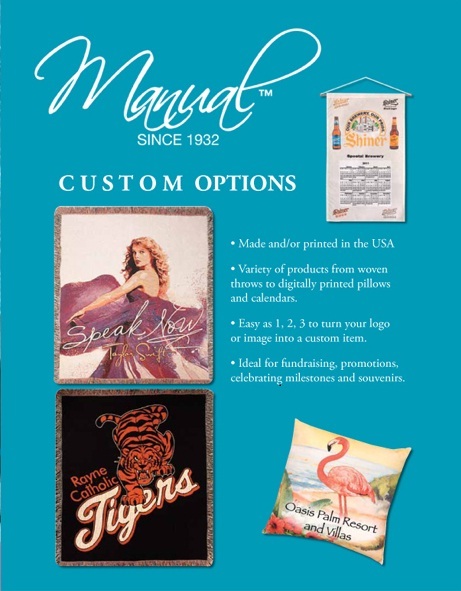 You can customize throws, pillows, tote bags, wall hangings, and more. There are three great ways you can create custom product: Customs Let our design department help you turn your concept into a great design. Scan & Go Take your own photo or image and let us turn it into a great product. Name Drop Pick one of our designs and add your Company Name or Message to it. CAN MEAN PROFITS FOR YOUR STORE, SCHOOL, OR ORGANIZATION… IT’S AS EASY AS 1,2,3. 1. Select your project. Whether it’s your school/corporate logo, team picture, a family photo, or a special landmark, MWW can create a beautiful woven treasure from your design. 2. Complete Order Form and Credit Application (if needed) and submit your project. Once we receive your project we will provide you with a jpeg via e–mail or send you a printout of your finished product. Upon your approval we will send you one (1) actual sample (except name drop program). Once approved we will begin production. 3. You will receive a beautiful woven product that will be an incredible and unique way to raise funds, honor special employees, remember events, even keep those soccer moms warm on the side lines. Please note, production lead time varies throughout the year. Typical projects can be produced in 4-6 weeks. Call for confirmation.